To locate the Apple/Mac Quicktime commponet for wmv files link click here you need administration rights to install. Thank you for coming to this site and welcome to a new way of providing rich feedback to your students. On this site we have tried to provide you with all the materials you need to try out using screen capture feedback as an individual or to introduce the idea to staff as part of continued professional development. Start by clicking here to see and hear student feedback via screen capture. Student feedback via screen capture digital video is a new technique of providing assessment feedback to students it is demonstrated via a case study of overseas MBA and undergraduate Accounting and IT students. 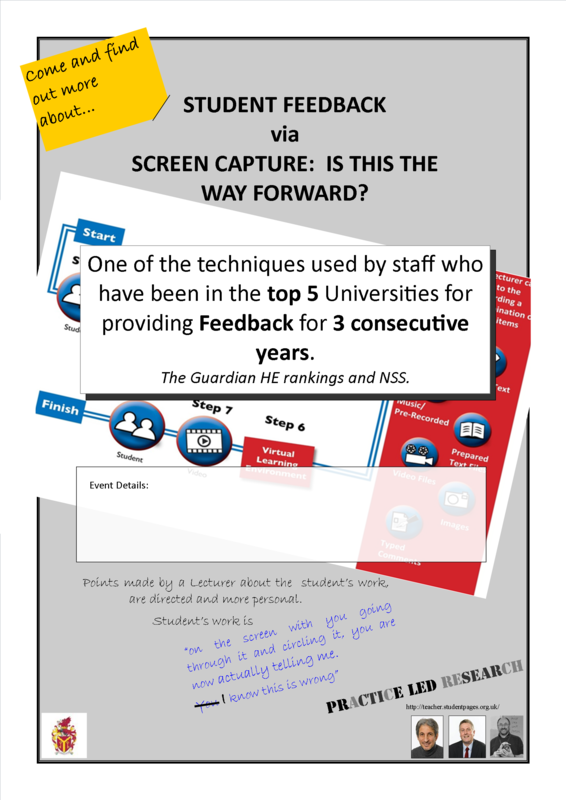 The feedback method uses inexpensive and widely available screen capture digital video technology; it gives the student an impression of being present during the marking process. In addition it enables the tutor to provide a richer range of feedback. For example the tutor can annotate and correct as with traditional methods; demonstrate step-by-step answer formulation; algorithms; show the solution, alternative answers, etc. Primary data was collected from target groups of students and from tutor reflection on using the new feedback medium. Results from a mixed qualitative and quantitative approach in this descriptive-exploratory study suggest that (a) this medium has advantages over traditional methods of communicating feedback, (b) that students enjoy this new form of feedback, and (c) that this encourages them to engage with and learn from the tutor assessment of answers, rather than concentrating only on obtaining marks. It seems that this generation of students find the medium a close fit with other forms of communication they are used to in their technology enriched lives. Your next step is to understand the process click on Overview in the left navigation. To actually try out screen capture you need to review your PC. Do you have screen capture software available (Encoder 9 is provided on the site via software downloads)? Do you have a microphone? Now with a working microphone and some screen capture software you can practise the ideas in the session "How do I create video feedback using encoder 9". The first time always takes the longest as you have to set up parameters, "learn how to ride the bike", etc. Steps 4 and 5 are the feedback steps for each student. Step 4 is when you record you comments and screen actions. Step 5 is you passing the feedback to the student via the VLE or e-mail. There are demonstration videos to watch if you are unsure of what to do next (click on the help line). Use the workshop material to create your first feedback screen capture video. The next stage is to disseminate what you have tried. We have provided you with an amendable slide show presentation and work shop materials. To review the concept of feedback via screen capture, please watch the two example files, followed by the demonstration of how we did it, and what the student would have received. To locate the Apple/Mac Quick time component for wmv files link click here. You will need administration rights to install the component.